Nature is romantic, so why not invite natural, rustic bedroom furniture into your home or cabin? Visit our showroom to see the selection of bedroom furniture we have to offer. Just like every other room in your home, our selection is spectacular! 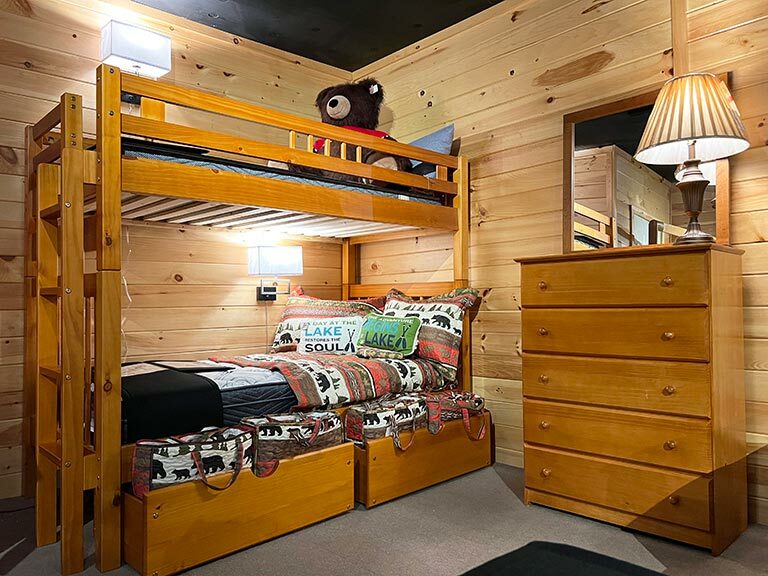 We offer singles, twins, queens, kings and rustic log bunk beds. To accessorize our bed frames we have a beautiful selection of headboards and footboards with matching nightstands, dressers, armoires and framed mirrors. Our mattress line is Symbol. Discover a world of natural comfort, discover the path to natural sleep with a Symbol mattress. We are proud to be a Symbol mattress dealer and carry a large line of Symbol products, including the popular premium gel memory foam and latex mattress line. Every bedroom should be cozy and comfortable and we’ve got you covered! Ask about our warm quilts from C&F Enterprises. These quilts are artist designed and will add the perfect finishing touch to any bed. To top it off take a peek at our beautiful area rugs to add that final splash of color and warmth.